For every protel Air HTML5 user there is a corresponding Flash user. Both users are linked to each other. In older protel Air versions (before June 2018) the HTML5 and the Flash user still had to be linked by hand. Meanwhile, the Flash user is automatically created and linked to the associated HTML5 user, so no further action is required. The User mapping shows you which users are linked to each other. 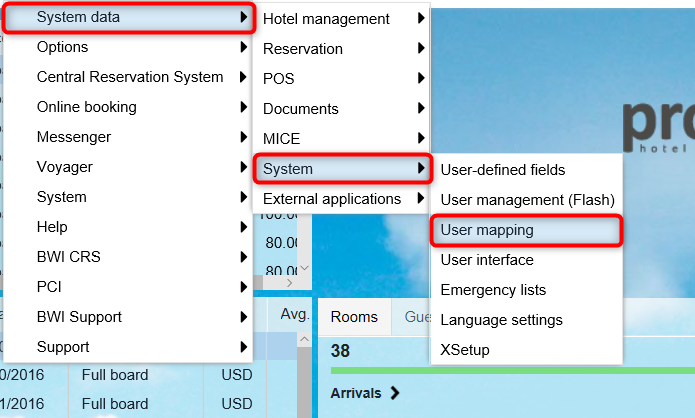 Log into your protel Air hotel software and select the suitable hotel (if there is more than one). Open the System Data menu and click on System > User mapping. On the left side (Login column) you can see all users created for the hotel in the protel Air Flash system data. The linked HTML5 user on the right side (Cloud user column) is granted the according user rights for the Flash system data. The user mapping also ensures that the correct user is displayed in the action log. If you do not map the user, the "Admin" user will always appear in the action log.